Jasmine Tinesha Fairell, 26, Dies In Crash Near Boca Raton On I-95 Exit Ramp | Schuler, Halvorson, Weisser, Zoeller & Overbeck P.A. A 26-year-old woman died in a crash in a notoriously dangerous interstate exit in Boca Raton. The Florida Highway Patrol identified the woman as Jasmine Tinesha Fairell, 26, of Opa Locka, Fla. She was traveling southbound on the Interstate 95 exit ramp to Congress Avenue when the crash happened. Fairell failed to negotiate the curve, driving her 2014 Nissan Sentra over the raised divider median. The car continued southbound and struck the concrete barrier wall. This exit has been the scene of multiple crashes over the last few years, including semis dangling from the overpass and also one that crashed onto the interstate. Also in recent times, a 69-year-old tow truck driver died when he fell from the overpass as he tried to secure a semi that had wrecked at the exit. First emergency responders arrived at the site of the crash soon after the accident happened. Fairell was pronounced dead at the scene. This route is partially blocked `due to the severity of the crash, causing traffic delays. Vehicles on this route are pulling to the roadside to allow crews work. The delay of traffic on this route is due to the severity of the crash. It is best to exit I-95 via W Atlantic Avenue in the North and Linton Blvd in the south. West Palm Beach attorney Jason Weisser of Schuler, Halvorson, Weisser, Zoeller and Overbeck responded to this unfortunate accident with a death of one woman: “This is a tragic accident here in southern Palm Beach County. We hope for the families sake that it can be quickly discovered what the cause was. Please be careful whenever you are driving a motorcycle, car, SUV or truck. This is especially true when you are transporting children in your vehicle. If you have been injured in an accident, call my office for a free consultation to find out what are your rights”. 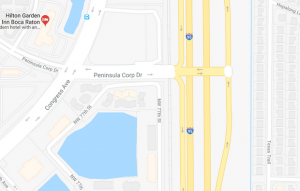 The post Jasmine Tinesha Fairell, 26, Dies In Crash Near Boca Raton On I-95 Exit Ramp appeared first on Traffic Center.